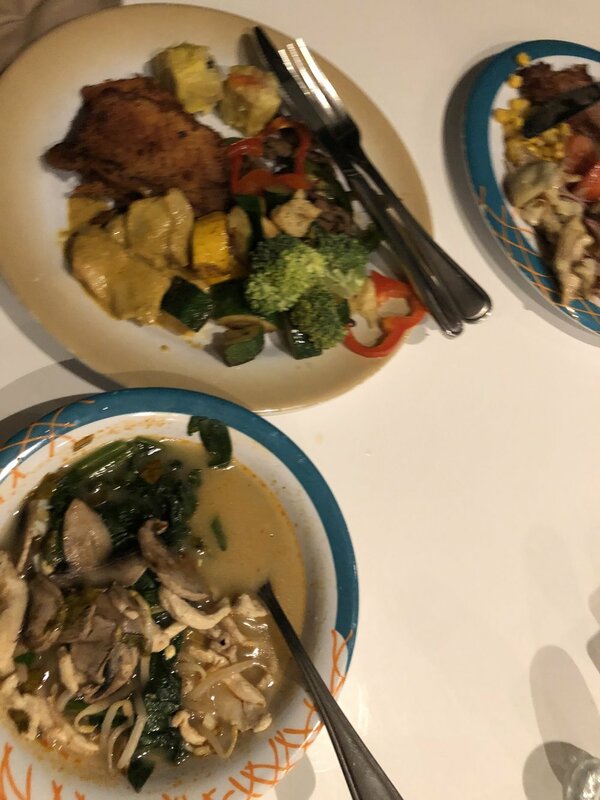 Did I successfully stay in ketosis on our 7-day cruise in Southeast Asia? But did I try my damndest? So some brief background: I’ve been on eating what the purebred keto folks would deem a “dirty” keto lifestyle for about 10 months before our cruise and I lost about 13 pounds. I was on vacation after all. In my usual life, I have a coffee with heavy cream, or sometimes coconut oil, and fast until about lunch. My work schedule works well with this. 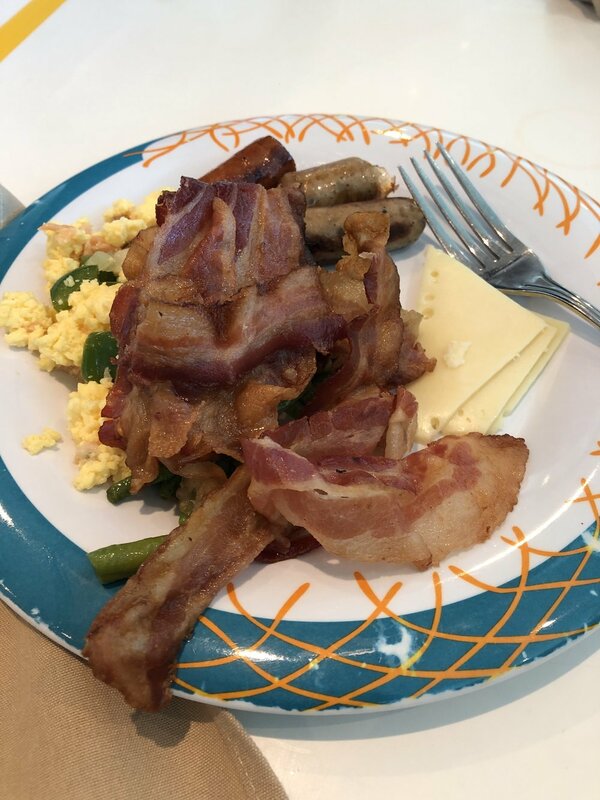 But I did eat breakfast a few times on the cruise because…well…BACON. After Day 3 of stuffing myself , I went back to skipping breakfast and found that I enjoyed my lunch and dinner much more doing this. Here is (almost) everything I ate on the cruise. There were a few times I forgot to take photos of my plate . Also we ate exclusively at the Windjammer buffet and one night at Chops Grille so idk what our main dining room offers? I also tried to stay as keto as possible and avoided pasta and rice and breads. But oh were they so tempting! 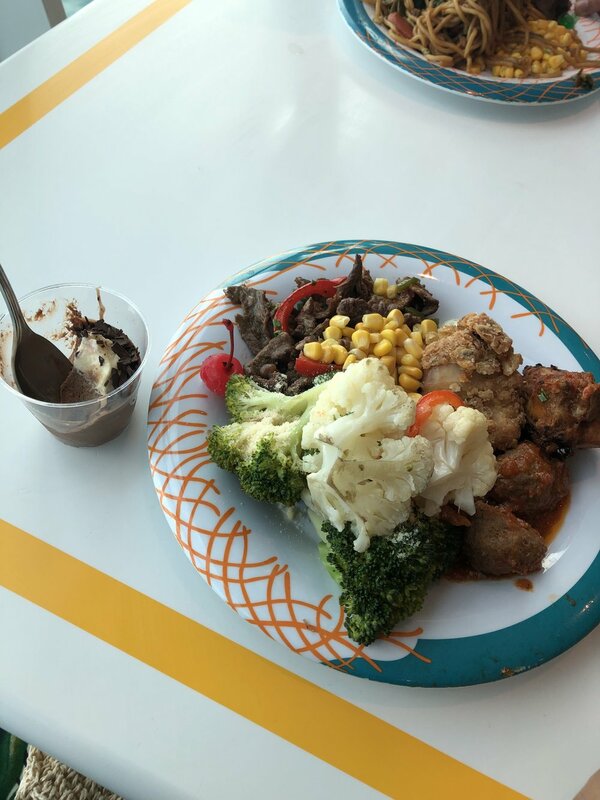 The game plan at every meal was to try every meat dish and supplement with steamed veggies, mostly broccoli and cauliflower. Plus I kept my eyes and mouth trained to seek, find and destroy every sugar-free dessert. Breakfast!!!!! I love eggs 🥚 the oatmeal in the background was my husband’s. For lunch one time they had frog legs ‼️. They tasted like chicken. I hate frogs so I told myself this was bde on my part. Indulged in a chicken Parmesan and it was EVERYTHING. This cauliflower au gratin my friend!!!!!! IT CHANGED ME! The last brekky before reluctantly hauling our asses off the ship. We used some of our onboard credit for the Royal Caribbean specialty coffee package. I literally asked for heavy cream with every iced latte I ordered at the Cafè Promenade and they only made it with heavy cream 3 times. I guess I understand why they didn’t use HWC it’s because they hate me and I get it because I hate myself. So. I also brought my usual stevia drops because SF syrups make my bladder literally contract so much it’s annoying and makes me pee in spurts. Awesome right? I also have a sweet tooth and I love cookies so I totally ate sugar free chocolate chip cookies every time they had them, even though I know they used regular flour. I couldn’t help it 🤤🤤🤤. A final note: everything, and I mean E V E R Y T H I N G, was flavorful and delicious and warm and scrumptious. Even the frog legs!!!!! Have you successfully keto’d on a cruise? Teach me your ways!